string(1246) "Resource Centre > Uncategorized > Corporate approaches to addressing modern slavery in supply chains: A snapshot of current practice"
In October 2015, complying with the UK Modern Slavery Act became a legal requirement for at least 12,000 companies in the UK and around the world. The Ashridge Centre for Business and Sustainability at Hult International Business School and the Ethical Trading Initiative (ETI) partnered to lead this research into company perspectives and responses to the risks of modern slavery in their global supply chains — against a backdrop of increasing global human rights legislation and reporting requirements. 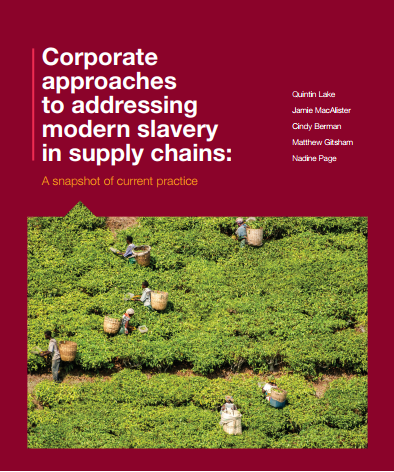 • Create a qualitative baseline for ETI on how their member companies are addressing modern slavery at the time the Modern Slavery Act is coming into force. The researchers interviewed 21 retailers and tier 1 suppliers from across the apparel, grocery, department store, home and garden retail, beverage, fresh produce and health and personal care sectors. This report reflects a snapshot of current practice in the companies who volunteered to participate. It is not a guide for good practice, nor an assessment of companies’ readiness or capacity to meet the requirements of new legislation. Instead, it draws on valuable insights from a group of companies that are likely to be further along in their thinking and practice than others.